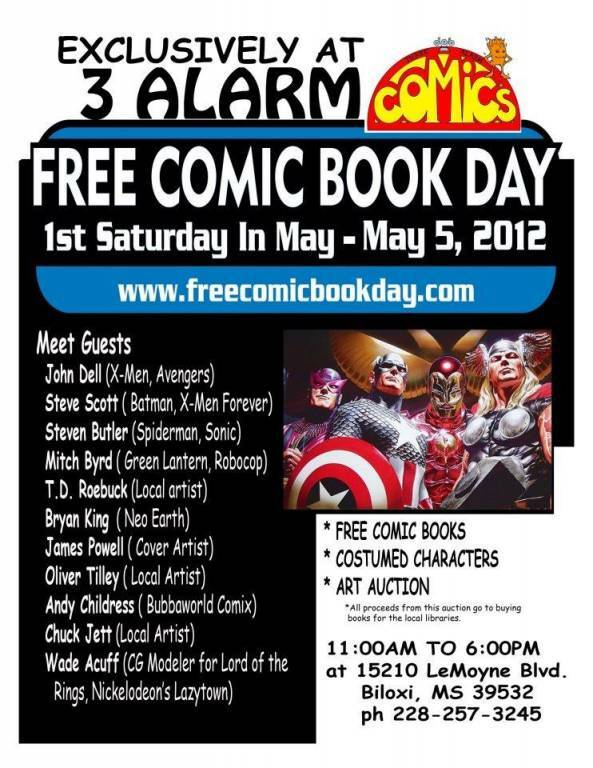 It is time for Free Comic Book Day at Three Alarm Comics on Saturday, May 5, 2012! For those of us who did not know, there is an annual day where select comic stores nationwide give away Free comics for just visiting their store. Did not know about it? Well, it is held annually on the first Saturday of May and is known as, you guessed it, Free Comic Book Day! At Three Alarm Comics in Biloxi, MS, they are definitely going all out to celebrate. There will be wonderful guests from the comic world and some great prizes! Come out and see them! Among the guests there will be Imagicopter participants Andy B. Childress, Chuck Jett, and James Powell. Go there and see their great work, maybe even take one home! Also present will be Jon Dell, Steve Scott, Steven Butler, Mitch Byrd, T. D. Roebuck, Bryan King, Oliver Tilly, and Wade Acuff. Cannot make it to Biloxi? Check out the site and see which comic store near you is participating!